Here. Now maybe Institutional Research will release the latest UO and comparator salary data? My understanding is that this will soon go to the membership for a vote. I vote yes. If you’re not a member yet, the info on joining is here. 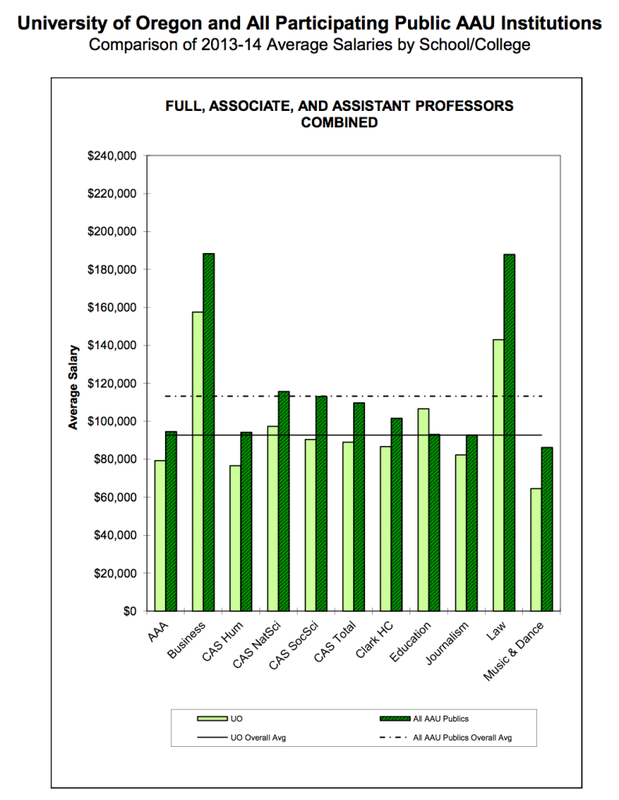 Bottom line is that faculty will get average 3% raises in Jan 2018 (old contract) and now 2% in Jan 2019, and 2.125% in Jan 2020, variously distributed as ATB, merit, gender equity and external equity. These raises and the continuing promotion raises will mean that UO faculty pay will likely decline relative to peer institutions. 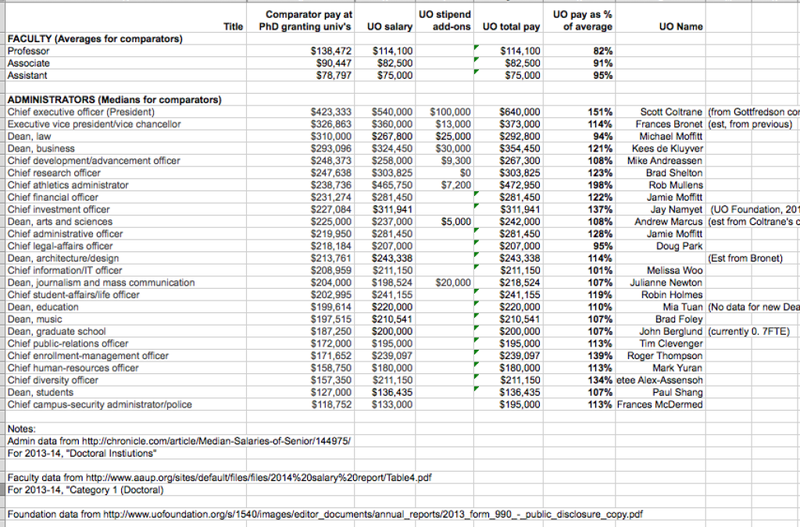 The union pushed for additional merit pay but obviously the UO budget is tight. 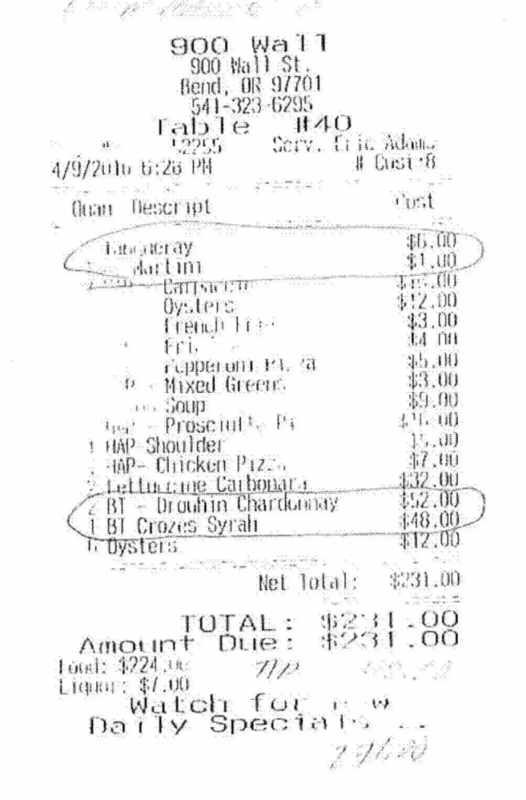 Next time we should call it “excellence pay” – that might get more traction. 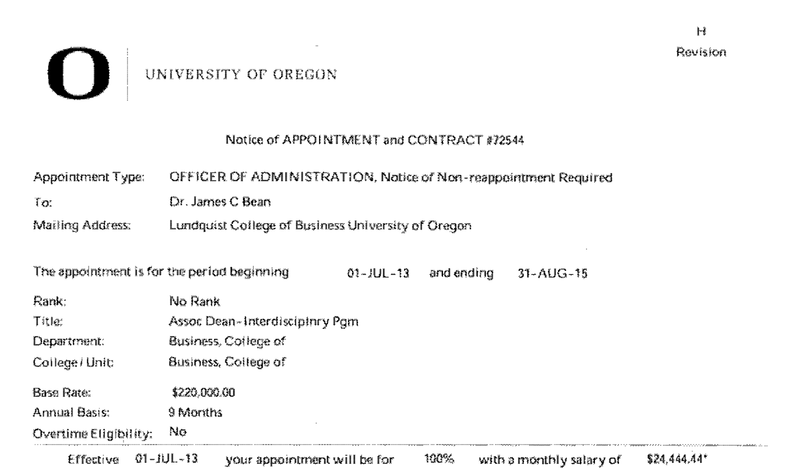 The gender equity raise is conditional on UO’s soon to be hired consultant finding something in the pay regressions that no one else has been able to find. Assuming they don’t, that will be distributed as ATB. The external equity raise will go to faculty in departments where pay by rank is 90% below peers, or about 1/3 of the TTF. As the statement below explains, the agreement for an extension rather than a new round of contentious bargaining (which would have started in January) was a cooperative one between the union and the administration. The UO faculty have suffered from a long series of incompetent and transient administrations. That era is over, and the union has responded appropriately. Late last week, we were able to reach a tentative agreement with the administration for a two-year extension to the Collective Bargaining Agreement. We will be holding a ratification vote later this month. The agreement will only be finalized upon approval of a majority of voting members. This email contains a short summary of the agreement, followed by a longer explanation and a link to the tentative agreement. This tentative agreement is not to be confused with the final 3% average raise from our current contract which consists of a 2.25% merit pool and 0.75% across-the-board raise and will take effect on January 01, 2018. Short summary: We agreed to a raise package for the 2018-19 and 2019-2020 years. This tentative contract extension reflects our desire to sustain salary growth & stability and correct observed inequities, even amid a highly constrained state and university budget context. Our current contract expires on June 30, 2018, but still includes a 3% raise package that goes into effect this coming January 01, 2018. The tentative contract extension builds on UA’s consecutive five-years of salary increases and will provide two additional years of salary raises, which will take effect in January 2019 and January 2020. 1. In the first year (beginning January 2019), the agreement is for a pool of money equal to 2.0% of the total salaries for the tenure-track faculty. The pool will be split between a 1.25% across-the-board raise for all TTF, and a .75% pool of money to address observed salary inequities by protected classes. 2. For the NTTF in the first year, there will be a 2.0% across-the-board raise. 3. In the second year (beginning January 2020), the TTF will have a pool of money equivalent to 2.125% of TTF salaries. This pool will be split between a 1.625% merit pool, and a .5% external equity pool. 4. In the second year, NTTF will have a 2.125% merit pool. The negotiations with the university over this extension took place throughout this summer. We engaged in a relatively quick and quiet negotiation process with the university because both parties thought that a contract extension made sense in our current unsettled university climate. The state of the university’s budget it still abysmal and the additional pressure from the state about PERS funding has not helped. Many of you may recall the proposed double-digit tuition hikes and the woeful support from the state to cover university operating costs. The failure to find new revenue at the state level threatens higher education with continued pressure to increase tuition, which is something we have stood against. Recall that Oregon sits near the bottom in spending for higher education in the U.S. and in corporate tax receipts. This bind will continue to pose challenges to the UO and public education in Oregon. Additionally, volatility in US immigration policy (see how nicely we put that?) has lead to deep concerns about the numbers of international students who will attend the university in the next few years. We also wanted to give our new Provost a chance to get a handle on his job before we entered into full-fledged negotiations with the university. The University of Oregon is not the typical research university, we have a strong commitment to shared governance and a deep respect for the work of the NTTF. We wanted to give Provost Banavar time to learn who we are before we bargained over sometimes contentious issues. We are very aware that there are pressing issues that need to be addressed. Job stability for NTTF, both in length of employment and in assignment, still needs to be improved. Support for faculty with children is woefully lacking. The service that all faculty do is still extremely undervalued. Before we agreed to negotiate an extension, the Provost’s Office pledged to work with us over the next two years on these issues and more. We are putting some faith in the Provost’s Office, but we believe that they are committed to finding solutions to help build a better university. Details and tentative agreement here. The current contract expires next summer, so bargaining would normally start in December. Faculty will get 0.75% across the board (ATB) and 2.25% merit pool raises in January 2018. This proposal is for a contract extension and 2% raises in 2019 and again in 2020. These would be part COLA or ATB, and part equity – which is a tough word to define. During the last bargaining session the administration flip-flopped between raises for internal equity, external equity, and gender/racial equity. At one point they refused to talk about external equity. Then they refused to talk about gender/racial equity. Then they agreed to a working group on gender/racial equity, but not external equity. They’re currently in the process of hiring a consulting firm to study that. Speaking of which – where are the bids? Three weeks and no reply to this simple public records request? As the Spring term was coming to a close, I had a conversation with President Schill about the possibility of extending our current Collective Bargaining Agreement (CBA) by a year or two. The central idea was that we would come to an agreement about a new raise package for those years and leave the rest of the CBA in place until we could bargain a full Agreement. I talked this idea over with our Executive Council and we all agreed it made sense to explore this idea with the UO administration. There were several factors that contributed to our thinking, but the main one concerned the unstable and uncertain budgeting future at the UO. We reasoned that locking in positive salary gains now, with no reductions to benefits, was something worth considering. Dave Cecil and I have met with President Schill and VP Bill Brady twice now and we have the outlines of a proposal. Essentially, we’d be looking at a 2.0% raise in January 2019 and January 2020. In each year, the 2.0% would be divided between a COLA raise for all faculty and an equity raise for faculty who are entitled to one. We are still working out the details with the administration on how best to distribute equity money, but we are insisting on a mix of gender and diversity equity adjustments, adjustments based on our external comparators, and inversion/compression adjustments. Agreeing to a two-year contract extension would delay bargaining for many needed non-salary improvements to the CBA. This concern weighs on our minds. The EC thought, however, that we will be in a better position to bargain with our new Provost after we have had a chance to build a relationship with him, and he has had a chance to acclimate himself to the university. We are confident that over the course of the next two years, he will learn that our concerns are shared by a great many people at UO, and he will want to work with us to solve them. There is nothing final about any of our discussions, and I wanted to include you in the conversation as soon as was practicable. I welcome your feedback about this idea. 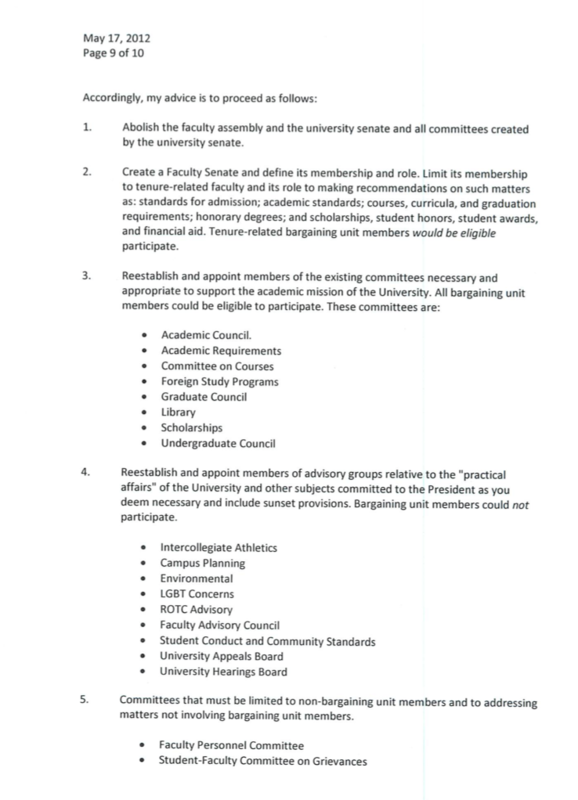 Any agreement we reach with the UO will have to be ratified by the membership, so look for your opportunity to vote. We hope to have a proposal for you to vote on later in the summer. You must be a member to attend. You can join at the meeting. It’s a union, of course there will be beer. [United Academics] will be holding our spring Membership Meeting April 5 from 5-7pm in Gerlinger Lounge. A pasta dinner will be served at 5pm, and as usual children are welcome. 5:30 Welcome and brief task force updates from: Equity; Violence Prevention and Safety; Sick Leave Bank and Child Care. Our members called for attention to these issues in the bargaining of our most recent CBA. We will hear updates on how each task force is planning to tackle these issues of importance to our community. 5:55 Discussion on non-renewals and the on-going realignment. What information about the process would you like UA to press for from the administration? What impacts do you foresee to your unit? 7:00 Closing toast to the memory of Antonin Scalia. 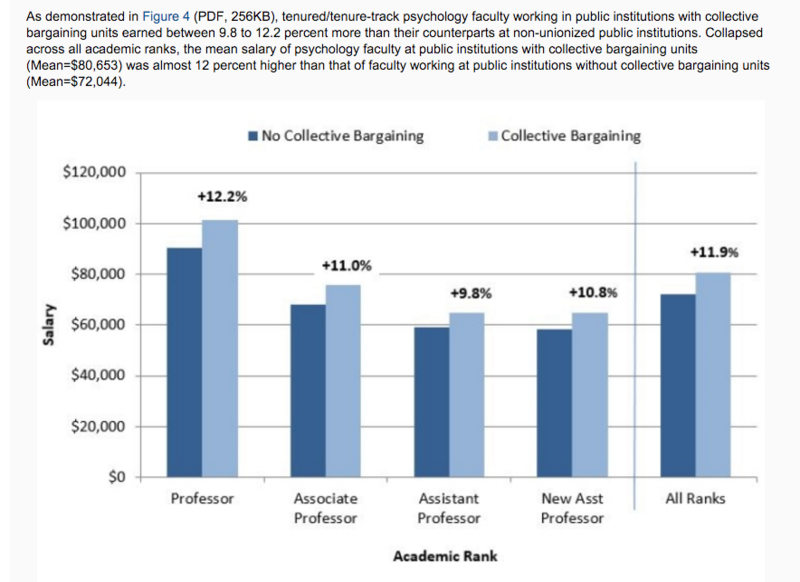 The presence of a collective bargaining unit in public institutions played a very important role in determining the salaries earned by psychology faculty. 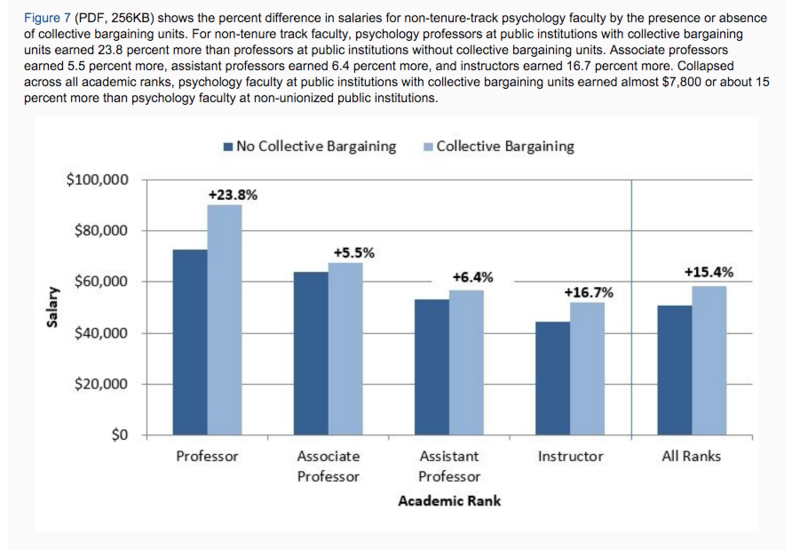 Salaries were consistently higher across all academic ranks for psychology faculty whose public institution had a collective bargaining unit. This pattern of results was found for both tenured/tenure-track and non-tenure-track faculty. “Because the U.S. government takes many positions that have powerful political and civic consequences, compulsory taxes constitute a form of compelled speech and association that imposes a significant impingement on First Amendment rights,” Justice Samuel A. Alito Jr. wrote for the majority in 2012 in one of the cases. “Because a public-sector union takes many positions during collective bargaining that have powerful political and civic consequences, the compulsory fees constitute a form of compelled speech and association that imposes a significant impingement on First Amendment rights,” Justice Samuel A. Alito Jr. wrote for the majority in 2012 in one of the cases. The NYT has more on the Friedrichs case here. Currently UAUO faculty and SEIU staff who don’t join their unions must pay “fair-share” fees (about 80% of dues) to cover the union’s cost of bargaining and enforcing the labor contract that they benefit from. If the Supremes rule against this practice, probably in June, public employee unions will be subject to the same sort of free-riding behavior that the government would face if people could opt-out of paying their taxes. Coltrane has also been working with new UO AVP Chuck Triplett (the former OUS apparatchik who helped Pernsteiner fire Richard Lariviere) and new University Board Secretary Angela Wilhelms to set up a President-appointed Policy Advisory Committee, and revoke the faculty authority that has existed since the founding of the University of Oregon and which is a normal part of faculty governance at other universities. In addition, last year BOT Chair Chuck Lillis went along with Geller and Berdahl’s plan to cut the Senate out of the Delegation of Authority debate, and tried to do the same again last month with Triplett and Coltrane’s plan to drop the Senate from the policy development and approval process. You might ask why our university’s top lawyer would attempt to hide his legal opinions about faculty governance from the faculty – and why people like Dave Hubin would help him keep the secret. 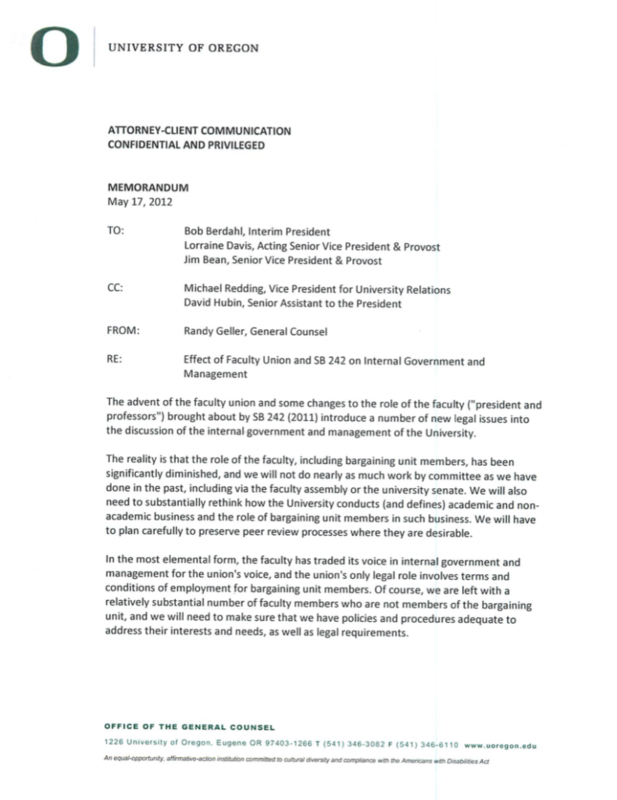 You might also ask why the our VPs for Academic Affairs, Doug Blandy and Barbara Altman, would try to hide their advice about grading in the event of a GTF strike from the faculty who assign grades. Maybe Scott Coltrane will have some answers at the next Senate meeting, Wednesday, Jan 14th. We’ve had a series of attacks on shared governance over the last few years, led by Bob Berdahl and Mike Gottfredson, but unfortunately continuing under Scott Coltrane with the attempt to subvert the Policy on Policies and the UO Constitution. So what sort of legal advice have our Johnson Hall colleagues been getting? They don’t want to tell us. I’ll go out on a limb and say Doug Park wrote this response to my public records request below. Not exactly trust inspiring. 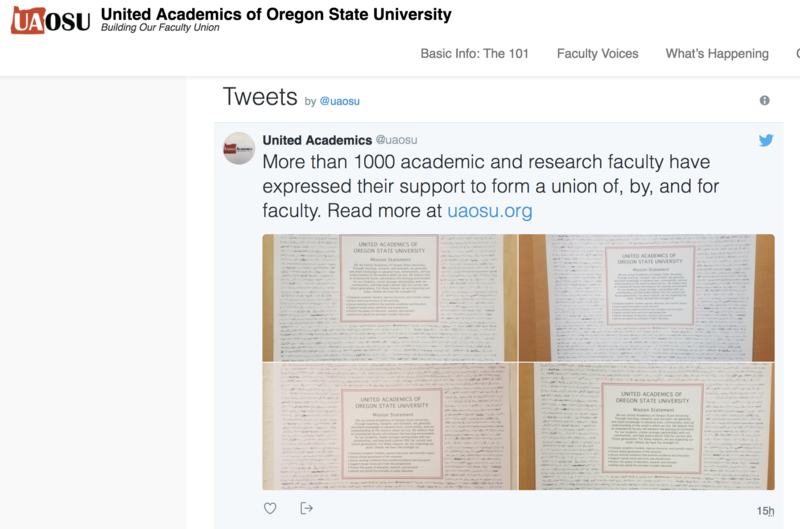 The only way the faculty is going to learn about these attacks is from leaks of “confidential” documents to UO Matters. So keep them coming! Given the broad scope of your request, we anticipate it would be necessary to sort through hundreds, if not thousands, of pages of documents to pull documents that are responsive to your request. In addition, you requested documents that you know are confidential because you specifically requested “legal advice.” Accordingly, your request is denied. Camilla Mortenson has the story in the Eugene Weekly, here. 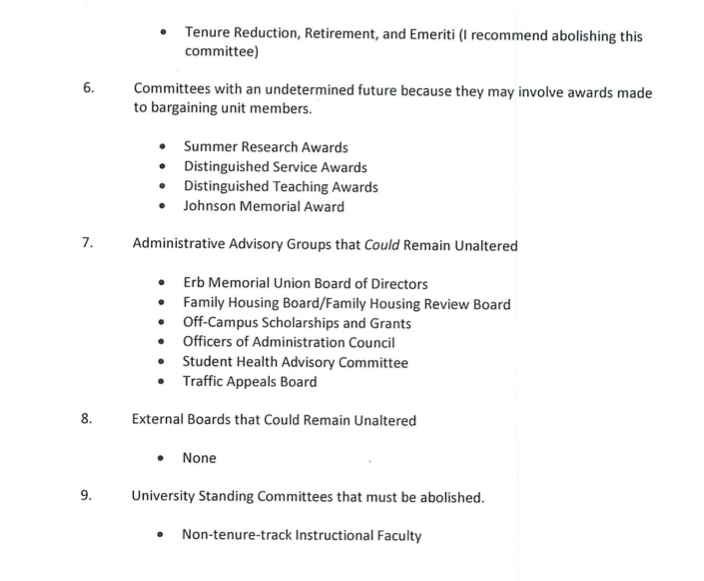 It seems Coltrane, Park, and Hubin won’t talk about the memo or about the extent to which it continues to guide the thinking of Johnson Hall and the new Board of Trustees. Assistant UO PR Flack Julie Brown is the highest ranking person who will talk on the record – and even she won’t disavow this plan? Yikes. 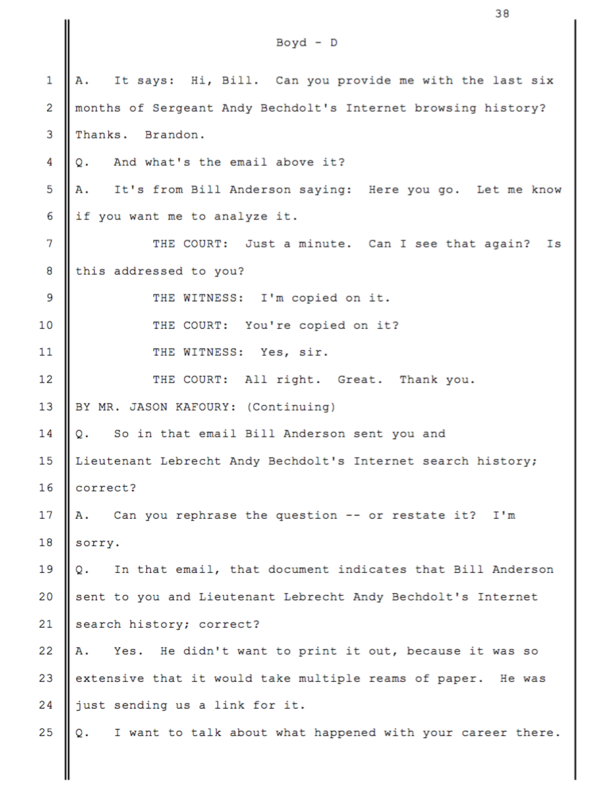 I’ll post additional docs as I get them. 4) open meetings for the UO Senate, Senate committees, and Administrative Advisory Groups. I am ccing current interim General Counsel Doug Park, as he should have access to the GC’s records and should be easily able to provide these documents, and Interim President Scott Coltrane for the same reason. I’ve also cced presidential assistant Dave Hubin, as he suggested that I make this public records request at the Senate Executive Committee meeting today and recently told the STC that future PRAAG meetings would be closed, and may have copies of the advice on these matters. Over the coming weeks, all units around campus will begin crafting workload policies for non-tenure track faculty. 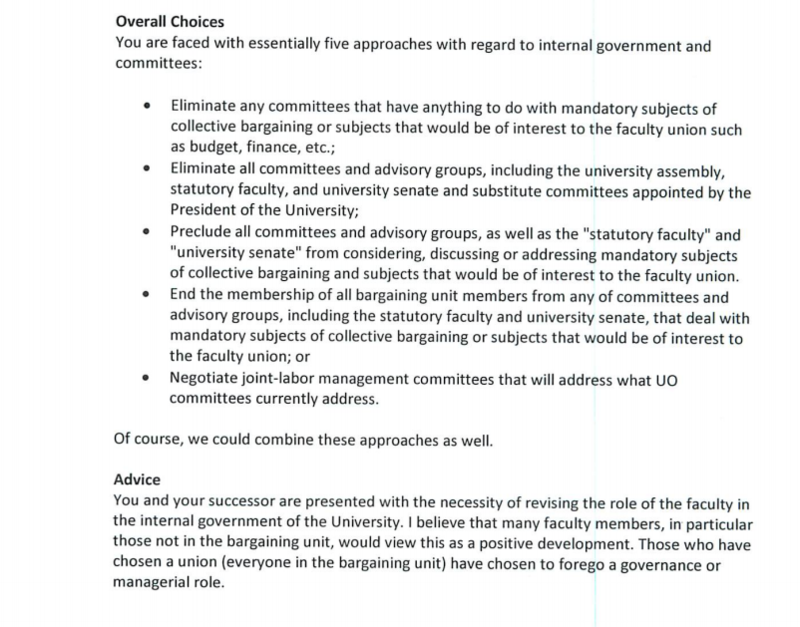 Deans and department heads will be providing input in this process, but in the spirit of shared governance and the collective bargaining agreement, the primary responsibility for developing these policies rests with faculty. To facilitate this important work, United Academics has some crafted some general guidelines for crafting NTTF workload policies; to access them, please click here. In recent days a rumor has been making the rounds that the standard workload for NTT faculty throughout the College of Arts and Sciences should be nine courses, with an additional service requirement, and that United Academics approves of this proposal. This rumor is not true. United Academics neither approves of nor requires any such thing. For United Academics’ full statement on this matter, please click here. All union members are invited to attend our Fall membership meeting this Wednesday, November 5, 5:00 to 7 pm. There will be half an hour for food and drink, starting at 5:00. Official business begins at 5:30. We have a full agenda. 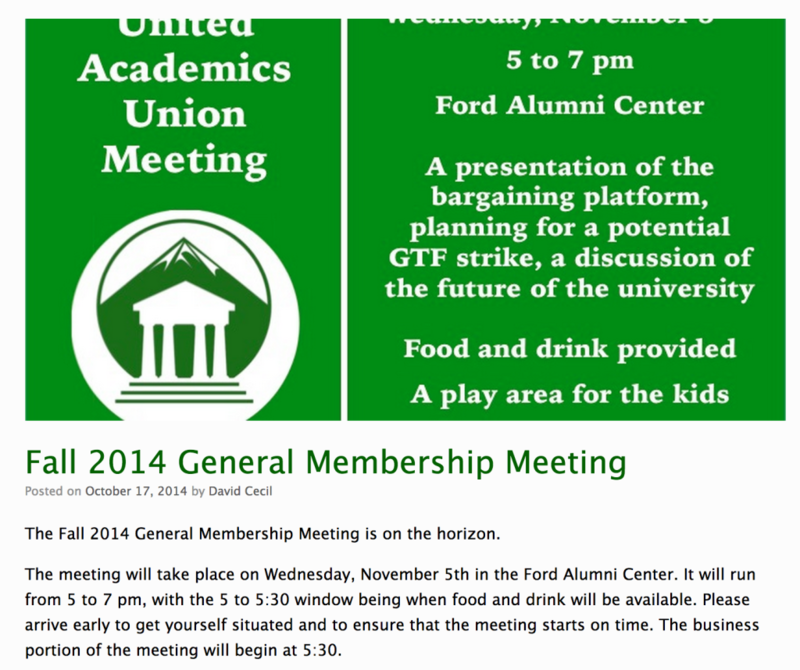 First and foremost, we will be discussing the potential GTFF strike & faculty rights and responsibilities. We will have a presentation on the bargaining platform and a Q&A with the bargaining team. We will also be talking about ways that our union can have an impact on the future of the university. Partly in response to requests from United Academics and the University Senate, the Board of Trustees’ Presidential Search Committee has scheduled a “Faculty and Staff Forum” for Thursday, November 6, from 5:30 to 7:00 pm in the EMU Walnut Room. We hope for a good turn out at this meeting, where colleagues will have their one opportunity to make nominations, to pose questions, and to offer input, directly and publicly, to the search committee. If you are unable to attend or would rather communicate in private, please take a minute to fill out the committee’s online survey or email the committee directly at PresSearch@uoregon.edu. … Continuing disinvestment in higher education across the country has led to an overreliance on contingent faculty. According to “The Just-in-time Professor,” a report issued by the House Committee on Education and the Workforce in 2014, in 1970 contingent faculty made up about 20 percent of the faculty in the United States and today, they make up about 75 percent of the instructional workforce. They are the new majority, and their plight is finally getting the attention it deserves.